This photograph has been scaled down; full resolution photograph is available here (1,280 by 780 pixels). A careful comparison of ships’ berths taken from their War Diaries plotted on the Ulithi Mooring Plan has allowed the identification of several other ships in this photograph. 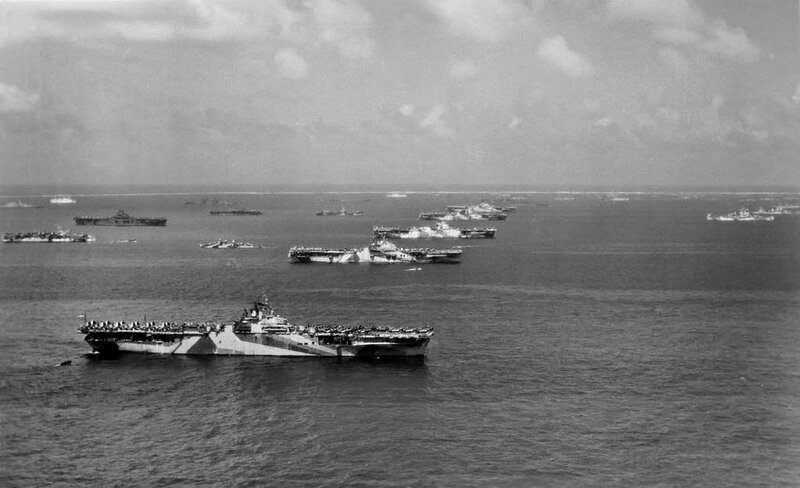 Of course, the main row of Essex-class carriers from front-to-back are the USS Wasp, USS Yorktown, USS Hornet, USS Hancock, and USS Ticonderoga. Beyond Ticonderoga is the cruiser USS Santa Fe. In the row abaft the main row (to the left) are front-to-back USS San Jacinto, USS Lexington (Essex-class), and USS Langley (Independence-class). Underway in the fairway between these two rows are the Fletcher-class destroyer USS Healy and oiler USS Cahaba. Across the back left-to-right are battleship USS Washington, hospital ship USS Solace, battleships USS Iowa & USS South Dakota, hospital ship USS Samaritan, battleship USS New Jersey and two ships I could not identify (yet). Along the right edge of the frame across the fairway from Santa Fe front-to-back are cruisers USS New Orleans, USS Biloxi, and USS Mobile (just out of frame beyond the Mobile was the carrier USS Essex). Missing from the fairway between Santa Fe and Mobile is the cruiser USS Oakland – she left that spot for refueling on 8 Dec 1944 between 1235 and 1445 hours (local time) which is when this photo must have been taken. Allowing 20-30 minutes for Oakland to weigh anchor and move to her refueling spot and another 20-30 minutes to steam back up the fairway to her berth leaves just over an hour that Oakland would not be visible in this shot. Given that many World War II photographs cannot be dated to the proper year, it is nice to find one that can be dated to a single hour.